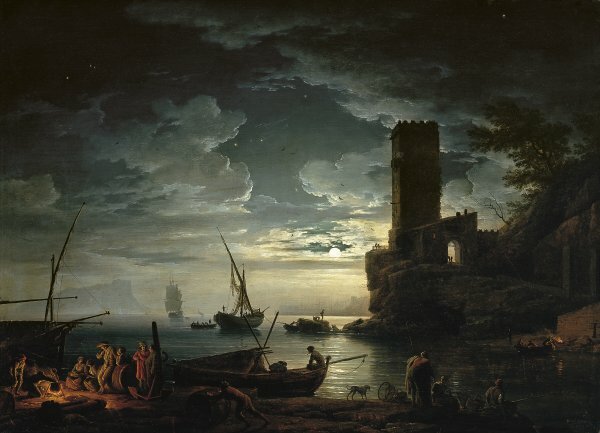 Night: Mediterranean Coast Scene with Fishermen and Boats is fully characteristic of Vernet's marine pictures: on a rocky shore, fishermen are resting after the day's work, cooking up a soup on an improvised fire, chatting with women, and smoking their pipes. To the right, a group is night-fishing by the light of a fire-brand. An overgrown fortified tower evokes medieval times. In the hazy distance a large seaport can just be seen, while a ship in full sail points to the open sea beyond the rocky promontory to the left. Typical of such works by Vernet, this scene of maritime activity does not describe an actual place but evokes the Mediterranean coastline of Italy, for example to the south of Naples. The velvety darkness of the night is enlivened by three sources of light: the warm light of the fire on shore, and the flaming torch in the fishing boat, and the cool light of the full moon, catching the clouds and the ripples on the water. Vernet was much admired for his ability to reconcile these contrasting effects of light in his own day, especially by the noted French critic Denis Diderot in his Salon reviews of the 1760s. Although it was almost certainly painted in France, just after Vernet left Italy forever, the painting is executed in a bold, free style, especially in the moonlit sky, which is typical of Vernet's Italian manner. The Carmen Thyssen-Bornemisza Night was originally conceived as one of a set of four marine paintings, each showing a different time of day: morning, mid-day, evening, and night. Such sets of four landscape and / or marine paintings, representing contrasting times of day, were among Vernet's works most in demand. Unfortunately, most of these sets have been dispersed by now. But a fine group of four marines, commissioned in Rome in 1749, is still intact and in situ at Russborough, Co. Wicklow, the country seat built and furnished in the 1740s and 1750s by the Anglo-Irish brewer Joseph Leeson. Through paintings of this kind, we can see how Vernet contributed to developing the sensibilities of his mid-18th-century spectators, by encouraging them to consider the infinite variety of nature and its effects of light, weather, and terrain -albeit from the comfort of their armchairs. The set of which the present Night formed a part was commissioned directly from the artist by another wealthy young Anglo-Irishman, Ralph Howard (created 1st Viscount Wicklow in 1785), who was in Rome from autumn 1751 to March 1752 during his Grand Tour of Italy. 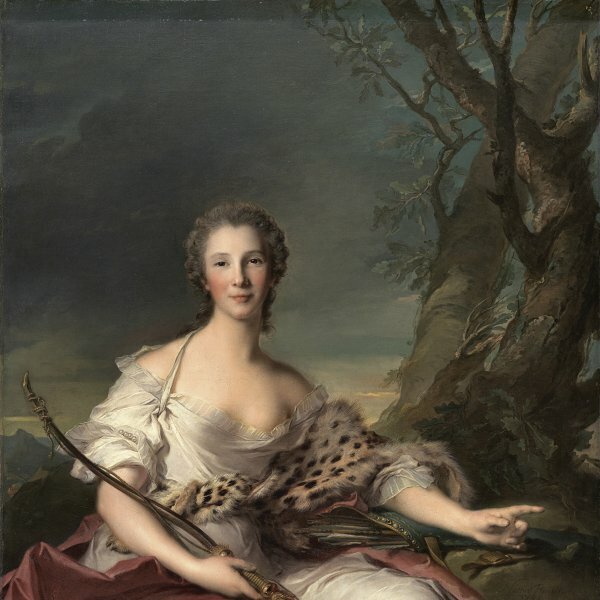 Howard purchased a variety of works of art in Rome, including a landscape and the four marines by Vernet, landscapes and figure pieces by the contemporary British artist Richard Wilson, and had his own portrait painted by Pompeo Batoni (now in the J. B. Speed Museum, Lexington, Kentucky). In Vernet's account book the commission, probably made early in 1752, is recorded as follows: "For His Lordship Howard five paintings emperor canvas representing seascapes with different subjects of my choice, one has to be finished by May 1752 and the other by March 1753, the price being one hundred Roman crowns, I have to deliver them to Mr. Rosel and Mr. Belloni has to pay me for them." Vernet, who was exceptionally busy during this period, was late with the delivery of the Howard pictures. One of the five commissioned works turned out to be a landscape, The Falls of Tivoli, dispatched from Rome in January 1753 by James Russell, Howard's agent. Early in 1753, however, Vernet moved to France to begin work on the Ports of France commission in Marseilles; he completed the four marine paintings for Howard in Aix-en-Provence in April. Until its recent appearance at auction in New York in 1994, Night: Mediterranean Coast Scene with Fishermen and Boats has been unrecorded since the 18th century. At the Shelton Abbey sale mentioned above, only two of the four Howard marines were listed in the catalogue: lot 1647, "Seaport with numerous figures and Man-o-war and companion picture with figures hauling nets and moonlight effect." However, the same two pictures were sold again a year later, along with the above-mentioned Falls of Tivoli, at Sotheby's in London: lot 66, "Ships at anchor in harbour, with fishermen drawing in nets in the foreground, a lighthouse in the distance; effects of morning and evening." It is safe to assume that the Sotheby's description of the two works, while still confusing, was the more accurate: the "Evening [...] with fishermen drawing in nets" was quickly resold to the Toledo Museum of Art in 1951. We can imagine that a dirty evening scene, perhaps untouched since the 18th century, might have looked like a "moonlight effect" to the cataloguer of the Shelton Abbey sale (where, in many cases, attributions and descriptions have proven to be unreliable). Trace of "Morning [...] ship at anchor in harbour" (like its companion, bought in London by the Paris dealer Cailleux) has unfortunately been lost since the 1951 sale. It therefore seems reasonable to trust the account of the Irish gentleman who consigned Night for sale in 1994, that it was purchased by his father as un-catalogued lot at the Shelton Abbey sale in 1950. It is consistent in date and dimensions, and also in its subjects and general disposition, with the Toledo Evening. Of the fourth painting in this set, presumably a Midday, and very likely showing a distinguishing shipwreck, like its counterpart still at Russborough) there has been no word since 1753.